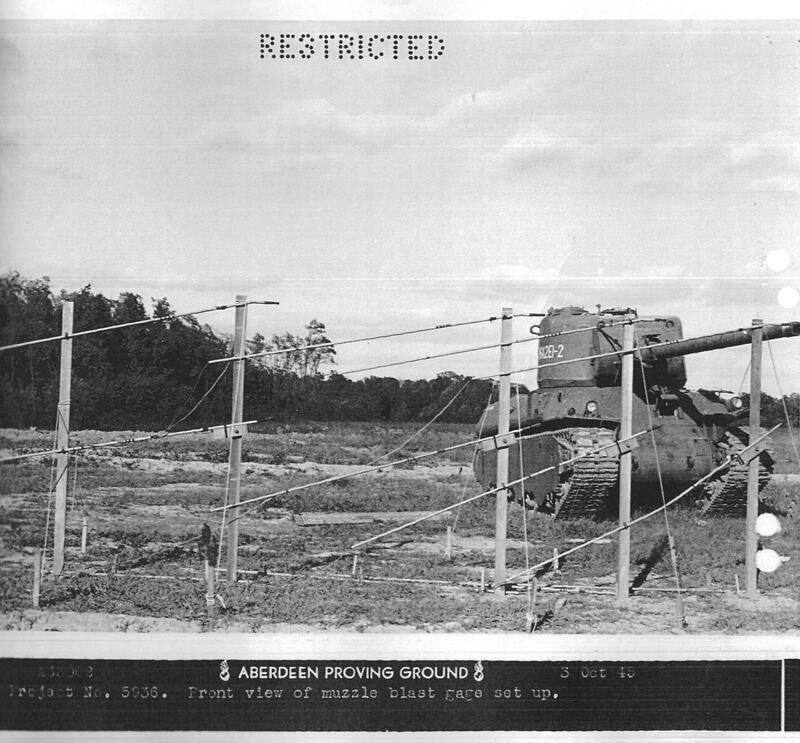 Following the Allied invasion of Northern Europe in 1944, the US Department of Ordnance, believing that they would encounter heavily fortified areas such as the Siegfried Line further in northwestern Europe, decided there would be a need for a limited number of tanks with heavier armor and more powerful guns in order to act as breakthrough tanks. In order to get past these fortified areas, the M6A2E1 project was started, which would mount the turret of Heavy Tank T29 on an up-armored Heavy Tank M6A2 hull. 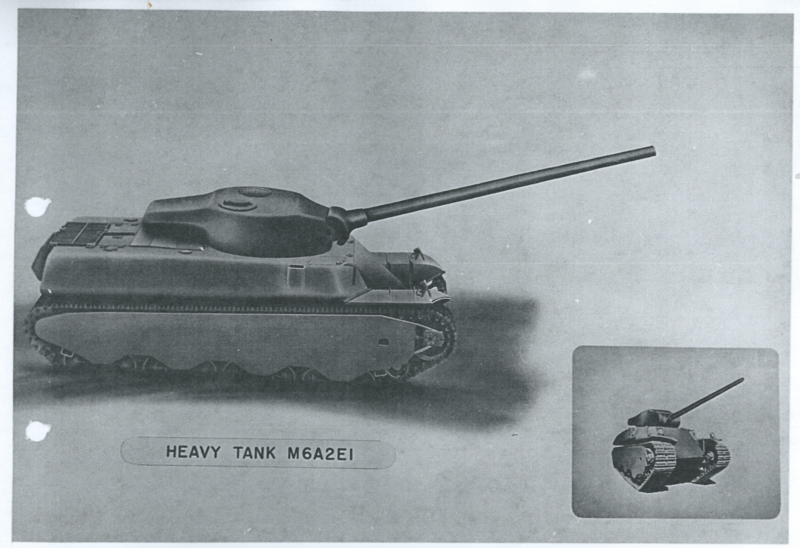 M6A2E1 initial draft design from July 1944; its similarity to the T26 turret is apparent here. Photo: History of the Heavy Tank, M6A2E1. 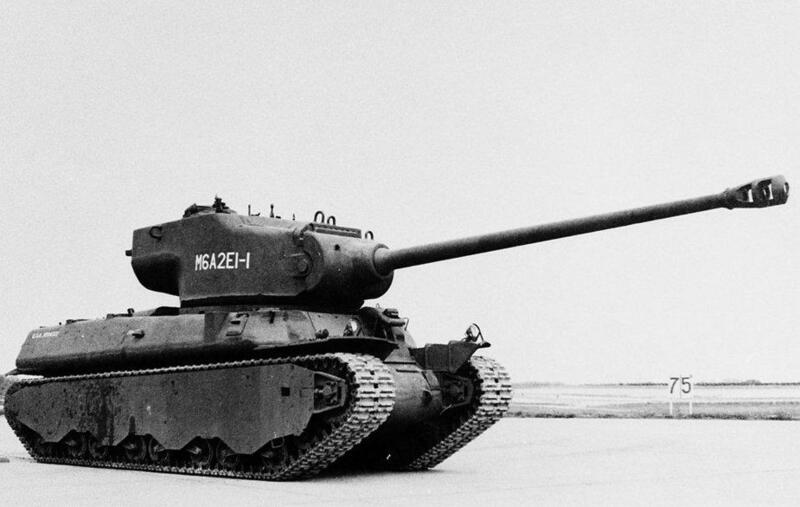 The Heavy Tank T29 had started its development during August of 1944 in response to the belief that the US would need heavily armored and armed vehicles to take on fortifications and enemy vehicles that would be encountered in the advance into Europe. However, the Heavy Tank M6 was chosen for this role instead as the T29 was still in early development and would likely not be adopted and available before the Allies encountered these heavier fortifications. Ordnance, having M6 tanks left over, decided that these could be modified to meet the needs. As such, it was proposed to modify the M6 to mount the T29 turret, and to increase its armor. To do so, the M6’s turret ring would be expanded. 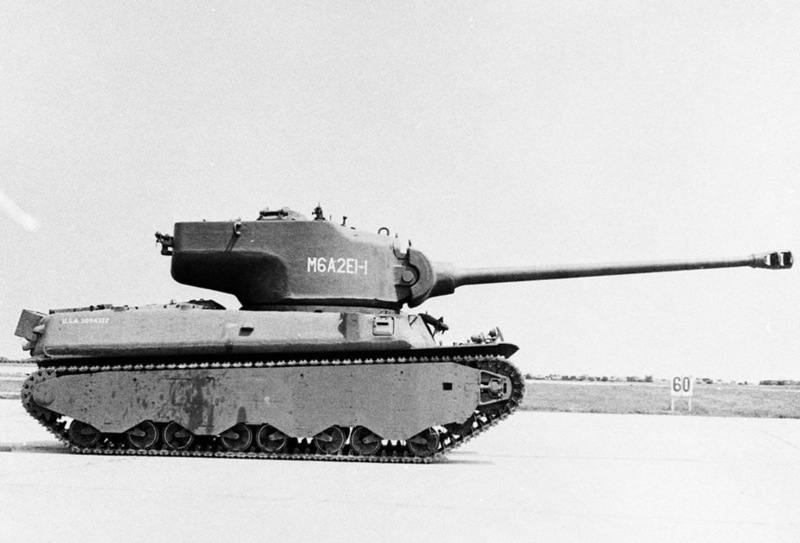 The M6 was a US heavy tank designed in 1940 mounting a 76 mm and a 37 mm cannon. It was in trials by 1943 but never put into service. There were 3 sub-variants of the tank made. These being the M6, M6A1 and T1E1. The M6 and M6A1 were similar, only differing in the M6 being cast and the M6A1 welded. The T1E1 was similar to the M6 but had an electrical transmission instead of a torque converter type. It had been proposed to standardize the T1E1 as the M6A2 but this was not accepted. Despite this, the M6A2 name appeared in a number of drawings and correspondence concerning the vehicle. To increase the armor of the tank, it was decided to remove the driver’s vision door along with the hull machine gun and then weld on additional armor to achieve an effective thickness of 7 ½ inches (190.5 mm). After this was incorporated into the tank, a tentative Ordnance Committee Minute (OCM) was written up on August 14th, 1944 for a total of 15 T1E1 tanks to be modified with the 5 remaining T1E1s being used for spare parts. This new vehicle was christened the M6A2E1 in the OCM, and delivery was projected for November 15th, 1944. The Army Ground Forces, who were encouraged by the idea of the tank and the project from the start, sent a cablegram to General Eisenhower on the matter on August 2nd, 1944. General Eisenhower’s reply on the 18th was that the M6A2E1 tanks were not wanted as they were deemed impractical for use. This effectively killed the project. This may not have been a bad thing, as tests with a T1E1 (M6A2) loaded to the expected weight of 77 tons (69.8 tonnes) showed poor climbing abilities, being unable to advance on a slope of more than 40 percent (22 degrees) inclination. Given there would not have been enough time to change the drive-gear reduction, the M6A2E1 would have been limited in what terrain it could operate on. Following this cancellation, it was requested that two should still be finished in order to test the T29’s turret and armament. This request was granted and 3 turrets were built by the Continental Foundry & Machine Company. Two of these turrets were then mounted on modified M6A2’s and were tested at the Aberdeen Proving Ground, Maryland, with the third turret being sent for ballistic testing at Watertown Arsenal, Massachusetts. The plan for additional armor of the initial designs was never implemented. Despite the M6A2E1 being used as a test bed for the T29 turret, the turret design for the T29 had not been finalized and was constantly being changed, subjecting the M6A2E1 to turret modifications. The earliest of these modifications was a turret proposal dated around August 1944 calling for frontal turret armor up to 7.5 inches thick (190 mm) and a gun mounting with -10 degrees gun depression and +20 degrees elevation. In September that year, a decision was made to make three turrets for testing. Two of these were intended to be fitted onto tanks, and the third was for ballistic testing. The first mockup of this turret was seen around October. 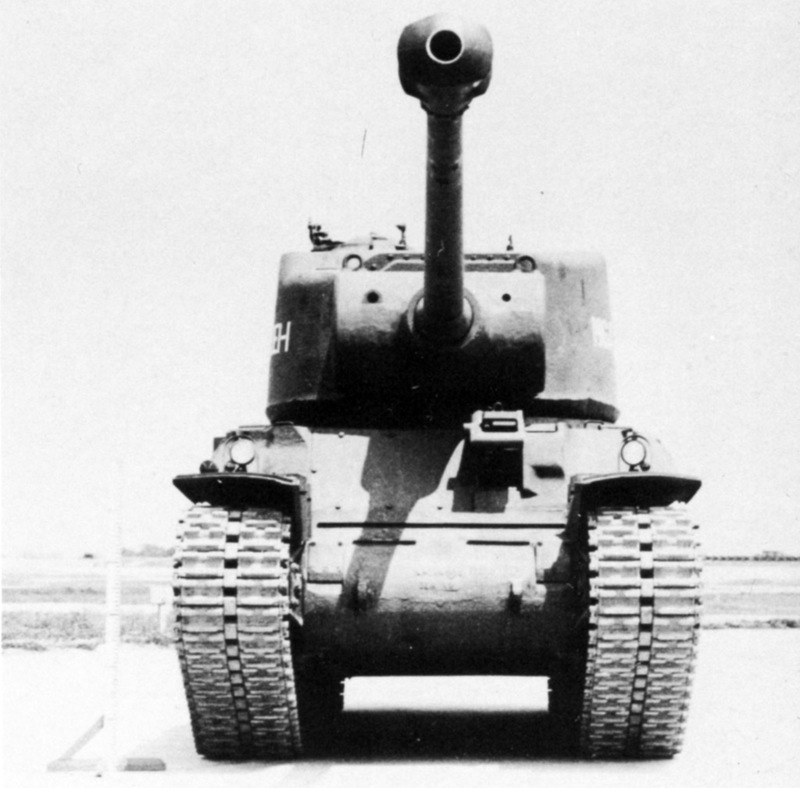 At this stage, the turret was essentially an enlarged Medium Tank T26 turret. In this initial design, much of the specifics were not fully detailed, such as where the commander would sit and if it would have one or two loaders. The front turret armor was also increased to 8 inches (203 mm) on a large external mantlet. In December 1944, this design was further modified. The mount needed to be able to, at a minimum, provide -5 degrees of gun depression and +15 degrees elevation, and if possible -10/+20. The turret was to be traversed manually or through an electric turret drive, and no attempt was to be made at stabilizing the gun owing to limitations with the gun mount. In January 1945, a further rework was done, this time to facilitate the installation of a 155 mm gun. By February that year, a contract was placed for the production of these 2 turrets, in addition, the turret was redesigned further to be lighter and more practical. The gun was moved inwards slightly and switched to separate two-piece ammunition. In March, it was decided to increase the armor basis for the turret and gun shield. The ammunition stowage, which was up to this point based mostly on the T26E1’s, was refined. The revised stowage now had capacity for 46 projectiles to be stored in the turret and a further 17 rounds stored in the hull, with 9 cartridge cases being carried in the turret for use as ready rack ammunition for a total of 72 rounds. In April 1945, a minor modification was done, assigning the commander a spot in the turret bulge on the center line. Due to the continual changes on the M6A2E1 and the parallel T29 project, in August, it was decided that these turrets were no longer deemed comparable to the current design for the T29’s turret and as such the M6A2E1s role of testing turret design was complete. During these constant modifications, a side project was also started, which was primarily aimed at lightening the turret by reducing the armor thickness, although this was not applied to any the produced turrets. The intended armor for this was as of December 1944, 2.5 inches (63.5 mm) on the turret sides, 1.5 inches (38 mm) turret top, and a 3.5 inch (89 mm) gun shield. The two produced tanks which were finished were not the same and were sub-designated M6A2E1-1 and M6A2E1-2. The M6A2E1-1 was similar to a typical M6, while the M6A2E1-2 was different, with its front plate being more vertically angled. The M6A2E1-2 at Aberdeen Proving Grounds on October 3rd, 1945. 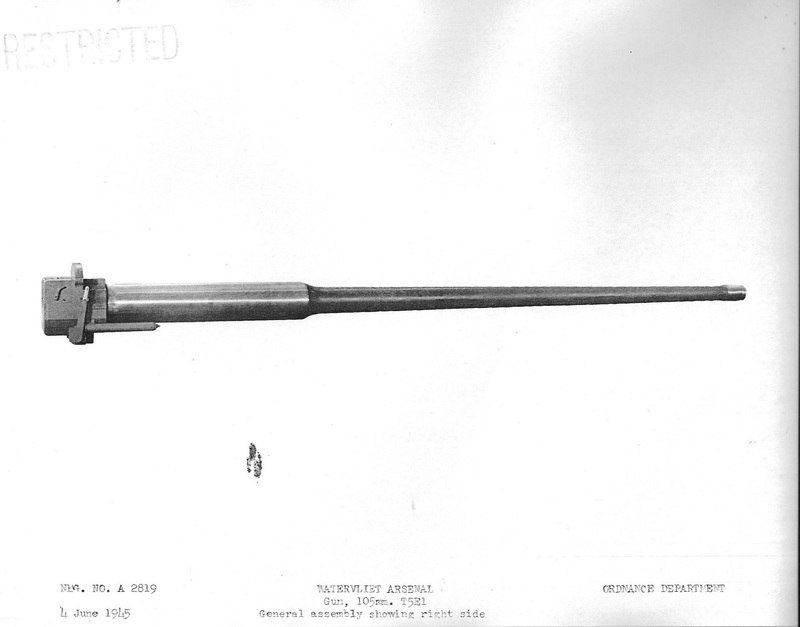 This image shows the original gun configuration without a muzzle break. Photo: Aberdeen Proving Ground. In addition to the constant turret development, the M6A2E1 was also a test bed for the T5 105 mm gun and its mounting equipment. The initial gun was based on the T4 105 mm AA gun, but had reduced barrel length and fired one piece ammunition. However, this ammunition was long and the gun would have needed to been depressed to allow loading. As a result, this was changed to the T5E1 gun firing two-piece ammunition. 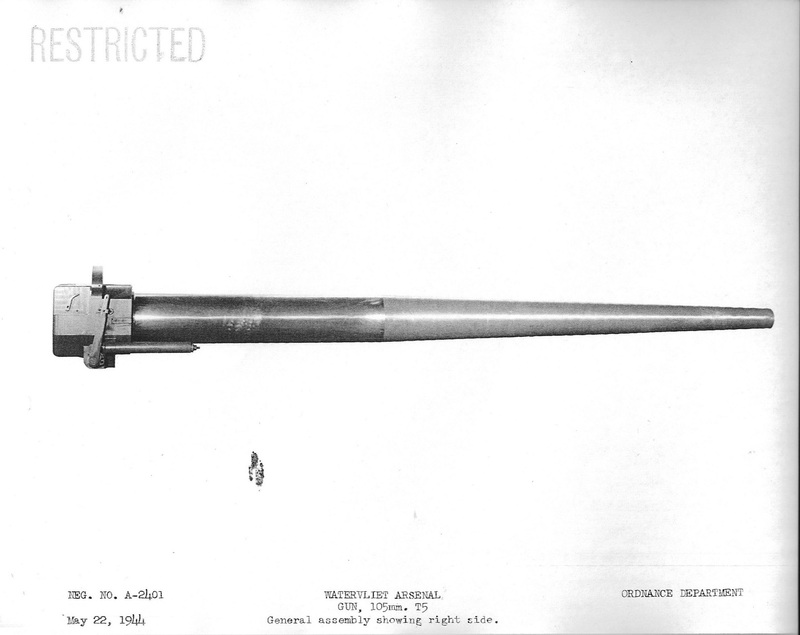 Additionally, it was decided to lengthen the barrel to the same length as the T4 105 mm AA gun. During trials, the tank fired T32E1 Armor Piercing Capped Ballistic Capped (APCBC), T29E3 High Velocity Armor Piercing (HVAP), T30E1 High Explosive (HE) and T46 White Phosphorus (WP). While these are the only known shells tested with the gun, it could have fired any round for the T5E1 105mm, such as T13 (APCBC), T37 Armor Piercing Ballistic Capped (APBC), and T182 (APBC). The tank also included a .30 caliber coaxial Browning machine gun for the gunner in the turret and on top there was a flexible AA mounting for a .50 caliber M2. For fire control, the M6A2E1 used the M70E2 sighting telescope. For indirect fire, either the M10 panoramic telescope or M62 elbow telescope would be used, and for vision, an M10 periscope was to be provided. The commander and driver were the only people with any good vision of the outside, the gunner also had vision of the outside but this was limited to the tank’s gun optics. The hulls of the M6A2E1’s were very similar to that of the normal M6 tank, however, a few modifications were made. The T29 turret was designed for an 80 inch (203cm) turret ring, whilst the M6 had been designed for a 69 inch (175cm) ring, so the turret ring had to be expanded. This tank’s crew consisted of 5 men – 2 loaders, a gunner, a commander in the turret, and the driver in the hull. The running gear consisted of Horizontal Volute Spring Suspension (HVSS) and utilized the T31 tracks, just like that on the standard M6 heavy tank. The two M6A2E1’s assembled were sent to Aberdeen Proving Ground for testing. This testing was to compose of turret design and armament testing. An early fault found with the gun mounting was the use of bronze trunnion bushings. These were not strong enough and caused excessive trunnion friction with the gun and were quickly switched to needle bearings which reduced this friction to an acceptable amount. In a later firing test, during which some 119 rounds were fired, it was found that the hand wheel effort needed on the elevation mechanism gradually increased and eventually it required so much effort the firing was stopped and the unit taken apart to find the fault. Upon disassembly, it was revealed that the trunnion caps, due to a design fault, had been rubbing against a part of the firing mechanism causing increased friction during firing. While testing the gun mount and elevation systems, priority was given to strain readings on the elevation mechanism when the tank was driven cross-country. To this extent, the elevation mechanism was tested over 9 runs at 5 (8 km/h) to 10 mph (16 km/h) with the tank mounting a muzzle brake and counterweight. During this, the elevation mechanism failed during the second run at 10 mph (16 km/h) with the tension reading 105,000 lbs (47.6 tonnes). The tanks finished testing in 1946. Following this, the first M6A2E1-1 was displayed at Aberdeen Proving Grounds, however, in the 1950s, this tank, along with various other vehicles at Aberdeen, was sent for scrapping. The history of the second M6A2E1 produced is unknown, but if it was not scrapped at the conclusion of its testing, it was likely scrapped along with the first one later on. While its design was rejected for use in combat, it was still important to the development of the T29 tank. Due to the use of existing unused T1E1s for a hull, they were able to have a tank ready that could test design choices for the upcoming T29 tank. When the tank was finished with turret design, it would find usage testing out the T5 105mm gun as well as gun mounting aspects with lessons learned from this being implemented in the T29 program. Illustration of the Heavy Tank M6A2E1-1, produced by Tank Encyclopedia’s own David Bocquelet.